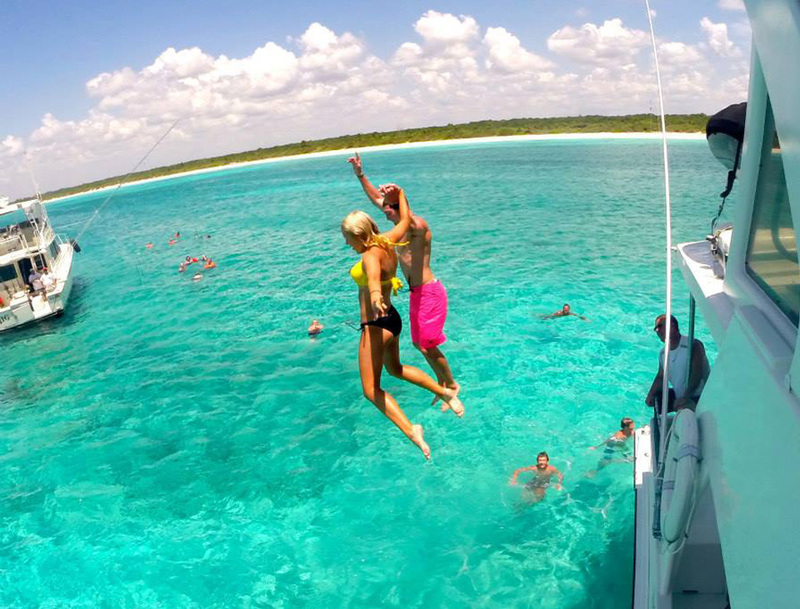 What is a typical snorkel and boat cruise like? Around the website there is a lot of detail on what is included when you decide to join us on your own private charter. However, I thought it would be a good idea to write out the day's events in a simple and chronological order here so you can get a better feel of a day at sea with us! We begin at the dock with a cocktail and some photos as you board the boat. Once everyone is on board, our crew will quickly prepare to head out. As we head out of the beautiful marina into the Caribbean, we prep the fishing lines and get those in the water so that we can troll for game fish our whole way north to this beautiful, secluded reef. At this point, your group can be enjoying cocktails, enjoying music from our huge catalogue on a 6,000watt system, picking your favourite karaoke songs with lyrics to be played on our HD TVs (indoors and out), or just relaxing on one of the many decks and enjoying the sun. When we get to the reef, we’ll drop anchor and give a quick safety demonstration with the snorkelling gear and get you guys into the water! 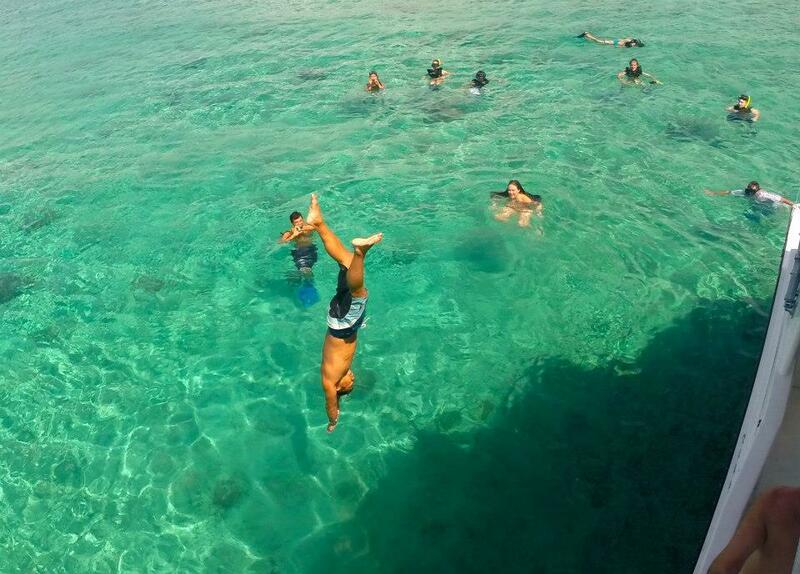 We also have a second level high-dive if anyone feels like jumping from the top into the turquoise waters below. 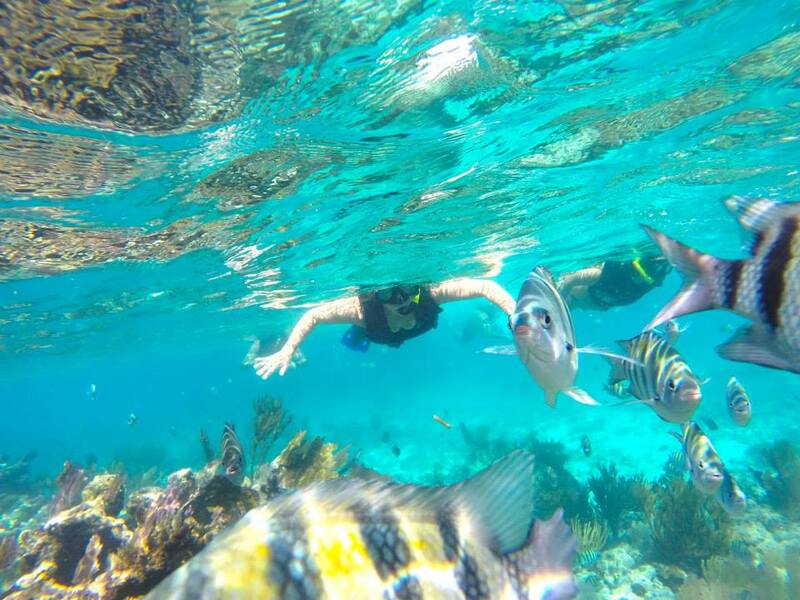 As you snorkel, you’ll see an endless amount of beautiful reef fish and often some sea turtles swimming around! After a good amount of time at the reef, when everyone’s back aboard we’ll pull up anchor and start heading south past the marina we came from (while trolling for fish again). We then pull into a private canal for the architectural tour, which also happens to be time to eat. As we slowly motor by boats and beautiful homes in this canal you will enjoy a full Mexican cuisine style lunch on the bow of the boat. After this, we pull back out into the sea for a short final cruise into the marina where we’ll dock. During all of this, remember that the boat is your home! Let us know if there is anything we can do for you to make it an even better experience and we will always do our best to accommodate you. We have full staff to make sure your drinks are never empty and to set up any songs you’d like to hear, and maybe to even encourage a bit of karaoke! Join us for a day at sea, and you might just walk away feeling like family after the best day of your vacation!